My friend and I aim to do a long distance walk each year, we started about five years ago with the Six Dales walk, which goes from Otley (where I live) up to Middleham in the Yorkshire Dales, crossing six dales during the 38 mile walk. We take these walks at a fairly easy pace of about 10 miles a day. The following year it got a bit longer, 84 miles of the Dales Way from Ilkley (just up the road) to Windermere in the Lakes. During the two years following we did the Bay2Bay walk, this is a walk starting in Grassington (further up Wharfedale) , one year we walked to the east coast to Robin Hoods Bay and the year after we walked west to Barrow in Furness in Cumbria, 100 miles each way, so we have actually walked across Britain! This year, for various reasons, neither of us was fit enough to manage a long walk, so we decided to do the Lortondale walk in the Lake District. It’s a three day walk, the web site said 10, 7 and 9 miles each day, they would carry all our bags to the next B&B and the best bit…we were provided with a taxi to take us to the top of the first hill!!! That sold it! It was sunny when we drove up to Keswick so we went the scenic route up through the lakes, rather than whizzing round them on the motorway. It turned out a bit more scenic than we planned as the main road was closed near Keswick so we drove over the Kirkstone Pass to Ullswater, the view from the top of the pass was amazing! You can just make out the road snaking down to Ambleside and Windermere. 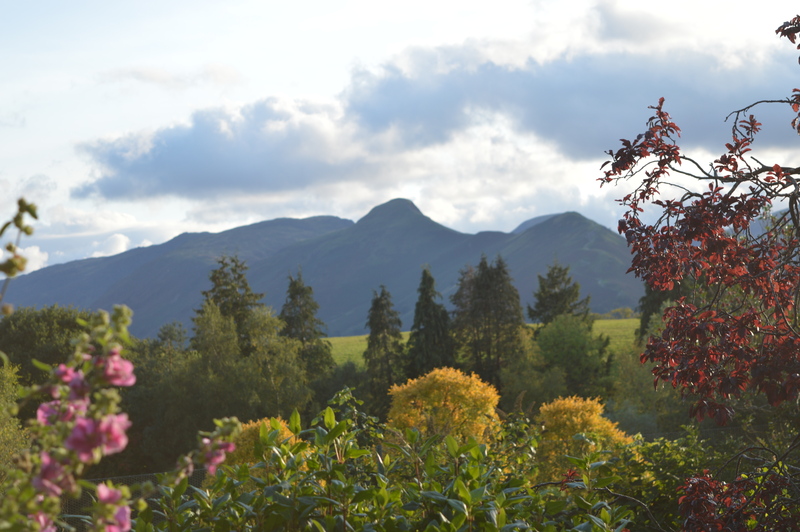 The hotel for the first night (and the last) was in a perfect spot in Keswick, overlooking the park, five minutes walk from the lake, this was the view from the dining room window…Catbells! HillCrest 22 is a lovely peaceful hotel, very friendly, with complimentary afternoon tea of homemade cake and biscuits when we arrived. They also had beautiful textile wall hangings on the stairs which I have just discovered were made by the owner, Annette Mikkelson, one talented lady! The next day, with a pack lunch in our rucksacks, the taxi arrived to take us up to the Whinlatter visitors centre. Whinlatter is forestry commission land, so we were walking through the plantations, it smelled very autumnal and the blue pine looked beautiful. After the forest we walked along the flanks of the fells, following the contours on the whole, we followed a wall for what seemed like forever…probably about two long miles! …along Lortondale, we passed some very fancy field gates… …down to the edge of Crummockwater before walking the length of Loweswater to get to our next B&B, a farmhouse up on the side of the fell. The actual walk, for lakeland, was actually reasonably undulating, however the 10 mile walk we were expecting, turned into 11 miles when the instructions came, and according to our fit bits was more like 13.5 miles…and it rained for the last 1-2 hours! We arrived at the B&B like two drowned rats, absolutely shattered! Really, for us at the moment, it was 3.5 miles too far, we did have to smile at our fitbits though, we’d done about 38,000 steps and 182 flights of stairs!! !…and boy did we know it! We walked the other side of Loweswater along a lovely wooded path to Crummockwater. We had spotted on the map a path which went the length of Crummockwater to Buttermere. It was a very wet path!! Especially after all the rain that fell overnight!! They kindly provided occasional bridges but you had to dance through the reeds and bogs to get to them! We did however spot a dry spit to have our lunch on. You can just see it sticking out into the lake. The weather was overcast but on the whole the rain held off until the last few minutes, even in the rain the Lakes look beautiful. Our walk was about 8 miles that day. We stayed at the Fish Inn in Buttermere which had a lovely deep bath!!! Bliss!! The official route for the final day was to walk about 13 miles from Buttermere back to Keswick, though you could knock it down to about 9 miles by catching the launch from Hawes End on Derwentwater. I’m sure it would have been a lovely walk, though a bit damp, but we would have been walking under pressure as we knew the last launch was at 4.45pm. We decided on an alternative…we got the bus back!! We had a lovely day, the bus didn’t leave until after 11am, so we walked down to Buttermere Lake and had a mooch along it’s shores. The photo is of Haystacks which is a great days walk on the far side of Buttermere. The bus route back to Keswick is a particularly scenic one, along the Honister pass, down into Borrowdale, then along the flank of Catbells before dropping down into Keswick. You have to admire the skill of the bus drivers driving these mountain passes, some of it was wide enough to pass a car, otherwise they had to use passing places. Once back in Keswick we had a look round the pencil museum, learnt a few facts, like did you know that the phrase ‘black market’ comes from the graphite industry, as in the 1760’s it was more valuable than diamonds and smugglers could be identified by the black on their hands! We walked down to the lake to eat our sandwiches with a view. We walked along to Friars Crag, then decided to carry on walking round Derwentwater to the first landing stage at Ashness Gate. It was a lovely walk through the woods and along the shore. We reached Ashness Gate just in time as two launches sailed into view, one from each direction. We decided to go back the long way round to enjoy the trip on the lake. We sat outside on the launch to enjoy the view, though I knew from experience not to sit at the front as passengers invariably get wet at the front as water splashes over, very amusing to watch! I took a photo of the boathouse at Keswick, it’s not a brilliant photo but it does allow you to compare with the photo from during the floods 18 months ago. It’s amazing to see when you think this was the whole lake, not just a river! We walked back up to HillCrest22, our lovely B&B again, ready for another afternoon tea having walked about 8 miles. Altogether we walked about 28 miles over the three days and managed to walk on the shores of four lakes, going all round Loweswater and walking the length of Crummockwater, as well as shorter walks by Buttermere and Derwentwater so we’ve decided to rename our walk The Four Lakes Walk. On our final morning we decided rather than setting off straight home we would drive up over Ashness Bridge to Watendlath, a tiny hamlet in a hanging valley above Derwentwater. It brought back many memories as I often chose to go up there for my birthday walk as a child, we would walk from there over to Dock Tarn and down to Rosthwaite. From there we took a detour up to Castrigg stone circle, I haven’t been there for years, it’s about 4000 years old and in a wonderful position overlooking the fells. Finally we drove down through the lakes, through the Yorkshire Dales and back home. What a wonderful time for you both. Loved the mountain pics and now I’m totally keen to check out the Castlerigg Stone Circle. Too cool. It was great Kathy, if somewhat exhausting! I don’t think I’ve been up to Castlerigg since I was a child! That looks so amazing! I feel really inspired to try that walk myself – would you tell me which company you were using for luggage transport etc? This sounds like a pretty wonderful vacation, the best of both worlds, nature and bathrooms!!! We had a lovely adventure as always, your pictures as usual are fab, question, what happened to all the rain? It was, we were definitely tired but happy! We’re very lucky where we live with the Lakes, the Dales, North Yorks moors, Derbyshire, all less than a couple of hours a way and much on our doorstep. it made my heart ache to see all the photos. It is such a beautiful part of the world and seems so unspoilt. The rain however would be less than romantic…. Thank you for sharing those beautiful photos of your country. I’ve only recently found Arthur Wainwright and his sketches and was amazed at the rugged areas. Seeing some in colour is magnificent. I’m quite sure you have enjoyed every walk. Thank you, when I regularly walked the high fells we always had Wainright in our rucksack and worked out our route in his books, we used to leave our route details at the local police station (pre mobiles!!) in case we got lost and it was always ‘ascending route wainright page 33, descending page 37…!! Thanks, it is a nice way to spend a few days with a friend. What a lovely walk! Certainly not easy in my book. I love Keswick and would love to visit again. And maybe do the flour lakes walk!